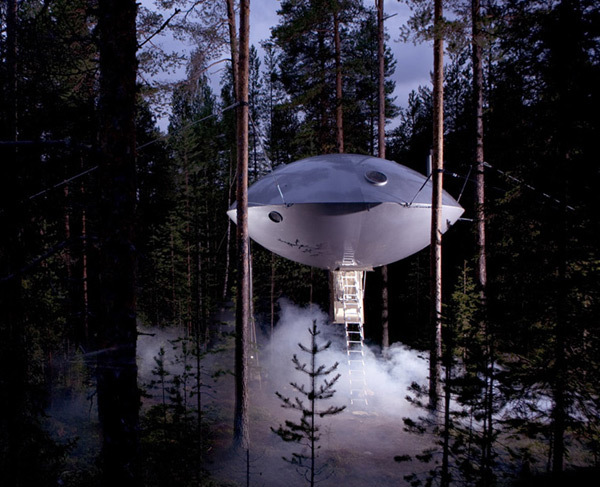 UFO Treehouse! - Treehouse by DesignTreehouse by Design - So, you thinking about building a tree house? Have extra-terrestrials landed on planet Earth? Quite possibly. What you see above, however, is from far closer to home. Part of Sweden’s übercool Treehotel — the folks who brought you the MirrorCube — this treehouse provides far out visitors an otherwordly experience. The treehouses at Treehotel are built by some of Sweden’s foremost architects. In fact, according to thisiscolossal.com, last year it won the the 2011 Swedish Grand Tourism Prize. Thinking about staying in this treehouse? Save up your money, because it’ll cost you $600 per night. Besides my fascination with UFOs, I like the round shape. It has way more eye-appeal than 90% angles and square rooms. It’s a great way to shake up a treehouse design. I also like how the ladder serves the double function of access to the treehouse and playing into the UFO theme of aliens landing from another planet. It would be interesting to see how this idea could be emulated using waste material, perhaps old metal containers of some sort, providing a prefabricated round shape. The way the treehouse is fastened to the surrounding trees is very interesting. Instead of being fixed with solid attachments, it seems to hang from the trees using wires. 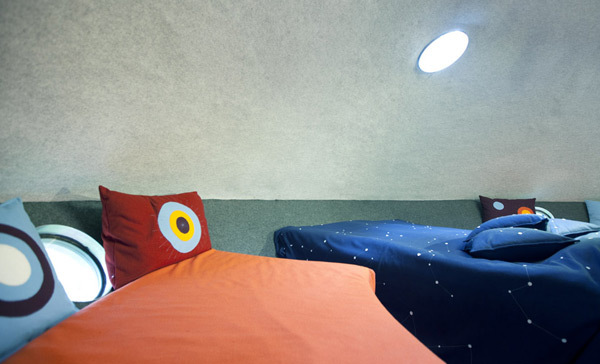 The designers of the UFO treehouse did a great job of keeping with the UFO theme inside with the stars and planets theme, as shown in the image below. « Out’n’About in Treehouse Heaven!